Home - Advertising and TV - Classic TV, Television Commercials, Vol2, Toys, HBA, more. 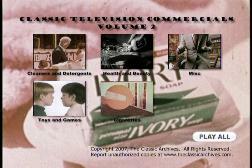 This is Volume 2 of our Classic Commercials series. This compilation includes cleaning supplies, health and beauty products, toys and games, some misc products, and more. This is Volume 2 of our Classic Commercials series. This compilation includes cleaning supplies, health and beauty products, toys and games, some misc products, and much more. This disk has 2 hours of cigarette commercials that are not on any one of our other DVD's. This is a unique DVD for all old commercial and television lovers and collectors. This DVD contains 3 hours of classic television history. Commercials, we all hate them. But it is quite amazing to see how they have changed over the years. Nowadays, they are multi-million dollar productions. Back then, they were not quite as polished as they are now. This amazing DVD contains a broad range of products being advertised, from cars, to food, to calculators and cameras.